Korean ceramicist Sena Gu graduated from the RCA in 2007 and ran her studio from London for six years. If you're looking for a really unique and stand out piece, look no further than this fine porcelain Cheetah plate by Sena Gu. Use for jewellery, keys or leave empty to appreciate its beauty. Seoul artist Sena Gu is interested in the unique vitality of objects and really has the ability to transform everyday objects. This beautiful and unusual porcelain jug can transform any table and is ideal used as a milk jug. If you like statement pieces, then this truly individual piece by South Korean ceramicist is for you. Entitled Cockatoo, it really does conjure up images of somewhere tropical. This fine porcelain piece will definitely be in our own personal collection. Seoul ceramicist Sena Gu has created a truly stand out two-piece vase that can be filled with small blooms or looks just as effective filled with the mirrored gold sphere. This pink bird jug by South Korean ceramicist is a completely unique and fun piece. Looks great as a standalone piece or as part of a collection. All products are handmade in Seoul. 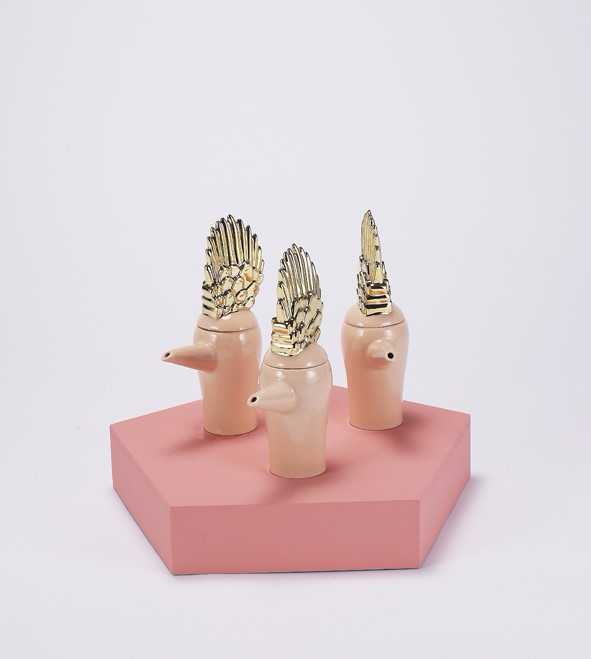 Korean ceramist Sena Gu, creates the most magical pieces in her home town Seoul. This fine porcelain plate can be used to hold jewellery, keys..., however we prefer to keep it empty so the beauty can really be appreciated. This unique fine porcelain dotted bird, with gold detailing can be used for milk, soy sauce or leave empty as an object d’art. This piece is a real conversation starter!